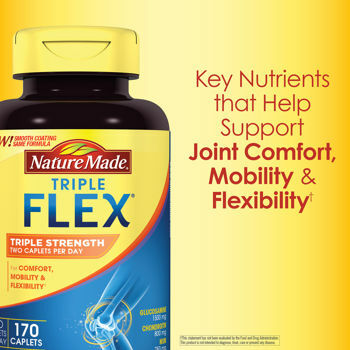 Nature Made TripleFlex Glucosamine 1500mg/Chondroitin 800mg/MSM 750mg 200 Caps SALE! SALE! 1-Day only! (Limit 12 bottles per order). Take two caplets daily, with food. Caplets can be taken together or at different times during the day. Take for 4-6 weeks to see results. Sodium 70 mg - 3%, Glucosamine Hydrochloride 1.5 g (1500 mg) - *, Chondroitin Sulfate 800 mg - *, Methylsulfonylmethane (MSM) 750 mg - *. Glucosamine Hydrochloride, Sodium Chondroitin Sulfate, Methylsulfonylmethane (MSM), Hydroxypropyl Methylcellulose, Titanium Dioxide (artificial color), Silicon Dioxide, Magnesium Stearate, Glyceryl Behenate, Polyethylene Glycol, Triethyl Citrate, Polysorbate 80, & Sodium Citrate. No Artificial Flavors. No Preservatives. No Yeast or Gluten. If you are pregnant or nursing, or allergic to shellfish, consult your health care professional before taking this product. Keep bottle tightly closed. Store in a cool, dry place, out of reach of children.